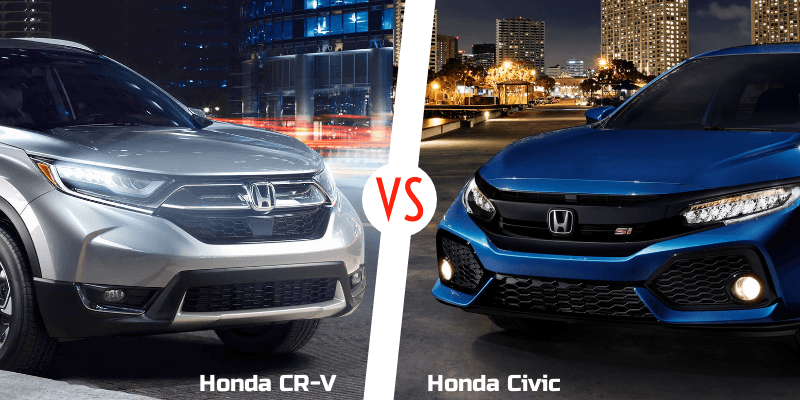 Barrhaven Honda | Blog | Honda Civic or CR-V: Which to Buy? Honda Civic or CR-V: Which to Buy? So, you’re looking into buying a new vehicle and you’re comparing the Honda Civic and the Honda CR-V. If you’re unsure about how to decide, you’ve come to the right place! Keep reading to find out if the Honda Civic or the CR-V is right for you! If you’re someone who often drives alone, a more compact car might be more convenient for you. Don’t be mistaken though, the Honda Civic definitely has enough room in the backseat for passengers to feel comfortable! Let’s face it, parallel parking can be a challenge, and it’s even more challenging on busy city streets. A small car like the Honda Civic might be more convenient for you if you live or work downtown. One thing to keep in mind when comparing the Honda Civic and the CR-V is that the Honda Civic is less expensive. In the process of staying within your budget, you can get a stylish car that has all the new tech that makes driving fun! As an added bonus, insurance is often lower for smaller cars. We tell ourselves it doesn’t matter what our vehicle looks like as long as it’s safe and gets us from point A to point B, but there’s more to consider. Whether it’s your first car or your dream car, it’s okay to prioritize exterior and interior aesthetic. Stylish design and high-tech features can actually improve your overall mood. We’re simply happier when we enjoy our surroundings. You never fully realize how important extra car space is until you need to go somewhere with the entire family. The CR-V is perfect for that. When comparing the Civic VS CR-V, car seats, toys, snacks, and movies can be hard to fit in the Civic. Heavy vehicles are also typically safer than small ones, which is a selling point for most parents. A four-door car makes visits to the vet significantly easier, especially if you’ve got a large dog. Not only is a bigger vehicle more convenient for transporting animals, but it’s also safer for you, and other drivers on the road. The CR-V has enough cargo space to fit up to 10 carry-on suitcases with the seats up, and 25 carry-on suitcases with the seats down. Will you ever actually need to travel with that much luggage? Probably not, but the option is there nonetheless! Alternatively, if you spend a considerable amount of time driving to work every day, a sturdy vehicle with 4-wheel drive might serve you well. Ironically enough, sports cars are not always the most appropriate for individuals with sporty lifestyles. If you are someone who does a lot of biking, hiking, camping, or rock climbing in the summer, the CR-V might be just what you need. It can fit your bicycle, tent, fishing gear, and whatever else you might need for your next adventure. If you have the extra space and rarely have to go into the city, the Honda CR-V might be the car for you. This crossover vehicle encompasses the best of both worlds when it comes to style and functionality. Don’t even get us started on fuel-efficiency! You won’t have to stop for gas as often as you would with a smaller car. Regardless of your lifestyle needs, Barrhaven Honda has the right car for you. Contact us today to learn more about dealership promotions or to ask any questions you may have!